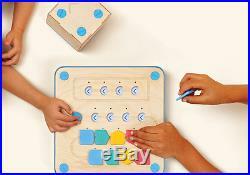 Primo Cubetto Playset The Coding Toy For Girls & Boys Age 3+. A friendly wooden robot, powered by a playful programming language you can touch. Montessori approved, and LOGO Turtle inspired. 1x Cubetto, 1x Board, 16x Blocks. 1x World Map, 1x Story Book. Are all of your products genuine? (A) Yes, all of our products are 100% genuine and are sourced from reputable companies to enable us to offer you the best possible prices. 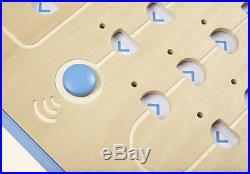 All products come in their original retail packaging unless otherwise stated. (Q) Why is my order showing a different company logo on box or packaging? (Q) Why is my order taking a little longer? (A) We send our items out same day if ordered before 12pm via Hermes sometimes the couriers are a little over run which causes delays not on our side so please be patient. (Q) Would you consider accepting a lower price for the item? (A) No, all prices are fixed and lower offers will not be accepted or considered, only if “best offer” is shown. We are dedicated to ensuring the highest possible quality service to our customers. Shopping Made Easy today is more than just the sum of its products – it’s a shopping experience that promises to surprise, amaze and amuse its customers by delivering extraordinary customer experiences. We now work with many branded names and companies and are always open to try new products and services if you feel there is something that may be of interest to us please get in contact. Made with love by. The item “Primo Cubetto Playset The Coding Toy For Girls & Boys Age 3+” is in sale since Saturday, July 15, 2017. 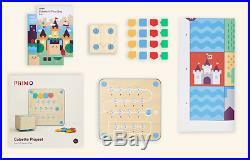 This item is in the category “Toys & Games\Creative Toys & Activities”. The seller is “shoppingmadeeasyltd” and is located in London. This item can be shipped to United Kingdom, Austria, Belgium, Bulgaria, Croatia, Cyprus, Czech republic, Denmark, Estonia, Finland, France, Germany, Greece, Hungary, Ireland, Italy, Latvia, Lithuania, Luxembourg, Malta, Netherlands, Poland, Portugal, Romania, Slovakia, Slovenia, Spain, Sweden, Australia, United States, Canada, Brazil, Japan, China, Israel, Hong Kong, Norway, Indonesia, Malaysia, Mexico, Singapore, South Korea, Switzerland, Taiwan, Thailand, Chile.